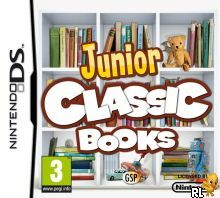 OverviewJunior Classic Books & Fairytales is designed to turn the DS into something of a makeshift e-reader (not to be confused with Nintendo's e-Reader), by offering users the chance to access a variety of classic tales with a flick of the touch screen. Now you can add videos, screenshots, or other images (cover scans, disc scans, etc.) for Junior Classic Books (E) to Emuparadise. Do it now!